Lee Friedlander was born in Aberdeen, Washington, in 1934. Beginning in 1963 with an acclaimed one-man show at George Eastman House, he has had exhibitions at the Museum of Modern Art, New York; Corcoran Gallery, Washington D.C.; National Gallery of Victoria, Melbourne; Center for Creative Photography, Tucson; and the San Francisco Museum of Modern Art. He is the recipient of numerous awards and fellowships including a MacArthur Grant (1990) and the MacDowell Colony Award (1986). Friedlander's photographs have been widely exhibited and published. They have also been the subject of over two dozen books including Self-Portrait, Like A One-Eyed Cat, American Musicians, Sticks and Stones: Architectural America and Friedlander: The Museum of Modern Art. Andrew Smith Gallery at 203 W. San Francisco St., Santa Fe, NM 87501 opens an exhibition of approximately fifty photographs taken in New Mexico by the American Master of Photography, Lee Friedlander on Oct. 31, 2008. Mr. Friedlander will be in the gallery for the opening reception on Friday, Oct. 31, 2008 from 5 to 7 p.m. to meet the public and sign copies of his newest publication, Lee Friedlander New Mexico, published by Radius Books, Santa Fe, NM (2008). The exhibit continues through January 15, 2009. Lee Friedlander ranks as possibly America's greatest photographer. For over fifty years he has prodigiously photographed what he calls the "American social landscape" with an unflinching eye for realism. Transcending mere documents, his photographs are the result of his artistic genius to structure scenes through the camera lens playing what chief photography curator at the Museum of Modern Art, Peter Galassi, calls, "a double game of light and shadow, near and far, which Friedlander wins by knitting the opposing terms together in a riotous and irregular but articulate pattern, making a whole that pulsates with life." The exhibit features photographs taken in Santa Fe, Albuquerque, Gallup, Chimayo, and Diablo Canyon between 1995 and 2005. 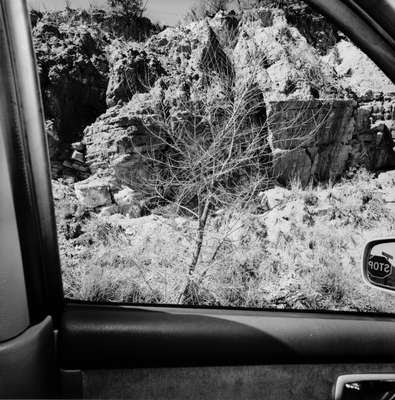 Friedlander's fondness for urban and wilderness areas in disarray is evident in this plethora of scenes that will be familiar to any New Mexico resident. Scraggly back yards, sun baked streets studded with poles and signs, makeshift hovels and historic buildings, juniper dotted hillsides, and ubiquitous pickup trucks are all packed together in a befuddling mixture of order and chaos, warmth and alienation, freedom and restraint, nature and commercialism. "The same nosy, curious eye is at work, poking through thickets and chain link fences, playing its usual Cubist game of figure and ground." The western landscape is an old subject in the annals of photography, but for Friedlander, used to shooting in urban and rural areas, this was new territory. By the 1970s the classically beautiful western landscape as exemplified by Ansel Adams had become questionable as a serious theme in contemporary photography. Photographers like Robert Adams have demonstrated that in our era Nature has been beaten back and relegated to the rarified confines of parks and wilderness areas. From coast to coast most of the U.S. is a maze of telephone wires, highways, billboards, strip malls, suburbs and gas stations. But that is exactly the sort of thing that appeals to Friedlander for whom "decorous enthrallment with beauty dissolves into uncharted fascination with fact." 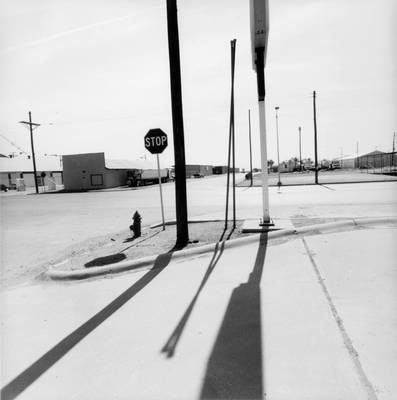 Friedlander began photographing in New Mexico in the late 1960s. Today this work is part of an ongoing series of landscapes he has been working on for more than a decade. Some of his best loved images were taken in New Mexico, including "105-34 - Albuquerque, New Mexico," 1972, in which a black dog with its tongue lolling out is the sole occupant at a corner of 12th Street and Central. This photograph reflects the core of Friedlander's work; his love of the vernacular, and his penchant for photographing the indigenous and commonplace ratherthan the exotic and sophisticated. Years ago Friedlander shot with a Leica, but since the early 90s his principal camera has been a medium-format Hasselblad Superwide that produces a square picture, with a negative nearly four times as large as the Leica's. The prints from these negatives have a special clarity and brightness that matches the pellucid atmosphere of the high desert. Telephone poles, signs, and street lights are scattered throughout a bland, sun drenched industrial district. Sky and pavement mirror each other's brilliant values and contrast with the dark horizon line of buildings. The vertical dimension is emphasized by telephone poles doubled in size by their dark shadows cast on the pavement. In this cross shaped composition of elongated forms a squat fire hydrant and a stop sign take on the appearance of whimsical side kicks. 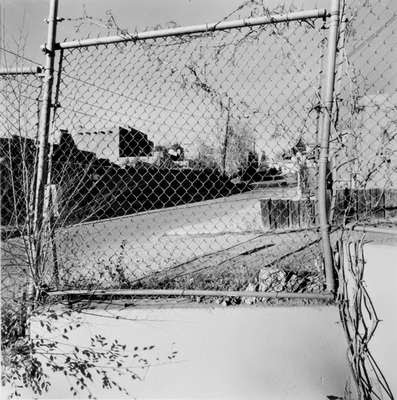 Friedlander snuck his camera into someone's yard like an intruder peering through a confusion of trees at something in the distance. 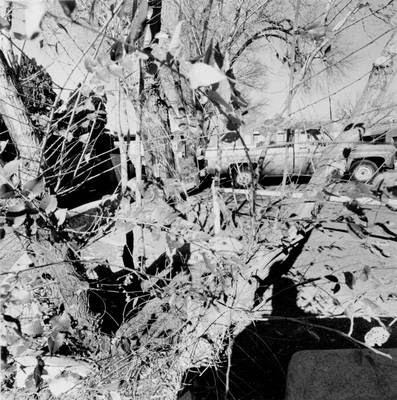 In a jarring collusion of foreground and background, leafy branches brushing the lens are mashed up against a pickup truck and houses in the distance. Fantastic distortions occur. The leaves are the same size as truck tires. Patchy shadows have more substance than houses. Poles, wires, houses and foliage all seem made of the same substance in this collage-like composition. According to Peter Galassi, "These photographs have a patchwork vitality reminiscent of modernist collage from Kurt Schwitters to Robert Rauschenberg, but with a crucial different: the unity of Friedlander's pictures depends upon the finely adjusted logic of their interior arrangements, but it is also the unity of the camera vision." With so many subjects to photograph on the streets of Santa Fe one wonders why Friedlander chose a featureless adobe wall. Is the subject of this photograph the traffic meter near the center of the composition, the peeling Chevy jutting into the right side of the picture, the adobe wall splashed with sunlight and shadow, or two feathery pine trees behind the wall? 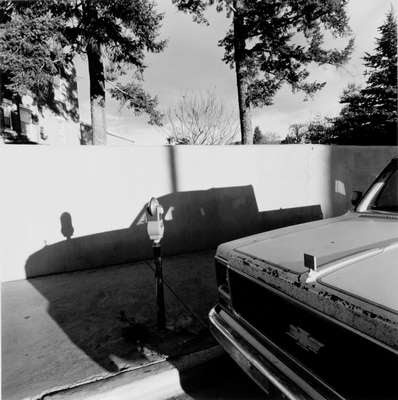 Maybe Friedlander's intention is describe what all see, but few would have noticed, the bizarre way tree mirrors tree, and how the shapes of car and meter are doubled by their shadows on the wall. The square metal frame of a hurricane fence entwined with vines fills the photograph, creating a whimsical duplicate of the square picture plane. Diagonal spaces within the weave of the fence create a moiré pattern through which can be seen the remarkably abstract shapes of flat roofed buildings and street, bisected by sunlight and shadow. This photograph of a nondescript street in some small town is primarily a study in geometric shapes. 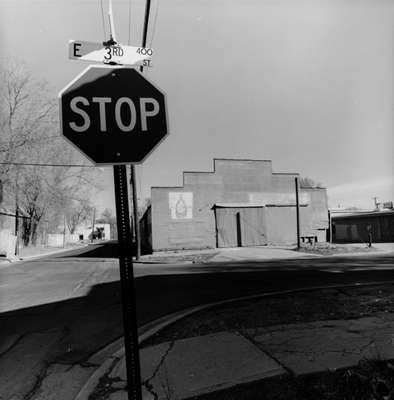 Dominating the picture is a stop sign topped by another sign containing the street number. Facing the camera is a corrugated metal building whose false front is shaped like stair steps. In between them the road forms a graceful crescent. This photograph conveys Friedlander's typically cool nonchalance toward his subjects, along with his distanced, yet playful, witty and ironic inquisitiveness. It has been said of Friedlander's photographs "the camera's mindless objectivity can jolt us into seeing things anew." 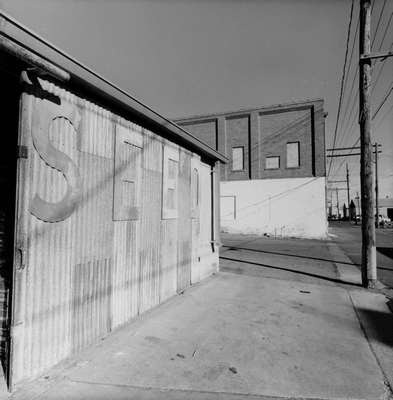 In this image a metal building with the word SEED nailed to its side is one of several structures on a quiet industrial street. Despite the word "seed" there is nothing growing in the scene, not even a blade of grass. The camera lens describes the lackluster architecture according to the laws of one-point perspective. Buildings, sidewalks, telephone poles and wires recede toward a vanishing point somewhere beyond the picture plane. But something about Friedlander's deadpan handling of the scene loosens it from its literalness. The otherwise characterless street suddenly becomes an interesting sequence of rectangles and squares resembling box flaps that could be folded up at a moment's notice. Since the beginning of his career Friedlander has taken photographs from inside his car, using the windows, paneling and mirrors as multiple viewfinders for whatever happens to be outside. In this instance, he stopped to photograph a small, leafless tree growing in prickly grasses below a rock escarpment. The steep, crumbly slope rising nearly to the top of the picture does not invite exploration, nor does it convey anything remotely sublime or pastoral. Though probably a natural geological formation it might just as easily have been thrown up by a bulldozer. In any case, it would be tough to traverse. Even its view is hindered by the scrubby tree in the foreground. Wryly reiterating that everything has come to a dead standstill, Friedlander included the car's rear view mirror with its reflection of a sign containing the single command: " STOP." 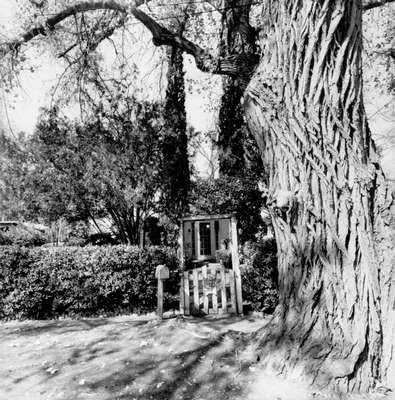 In a neighborhood bypassed by time and developers Friedlander photographed at close range a massive cottonwood tree with bark resembling thick slabs of clay. Nearby is a dense hedge, an old fashioned mailbox, and a rickety wooden gate leading to a house nearly hidden in the overgrowth of vines and trees. Only the front door is visible and it appears strangely diminutive next to the luxuriant plant life. What makes this photograph interesting is that within Friedlander's enormous body of highly complex images this is a perfectly ordinary shot, almost like a moment of repose. The fact that every so often Friedlander shoots a charmingly picturesque scene merely adds to the breadth of his work and the paradox of his vision. Gallery hours at 203 W. San Francisco St. location are 10 - 5 Mon. - Sat. Gallery hours at 122 Grant Ave. gallery are 10 - 5 Tues.- Sat. Peter Galassi, Friedlander: Museum of Modern Art, New York, 2005.